Alstom set a high-speed record in Poland reaching approximately 182 miles per hour while conducting tests on its Pendolino train on the Gora Wlodowska-Psary line north-west of Krakow. 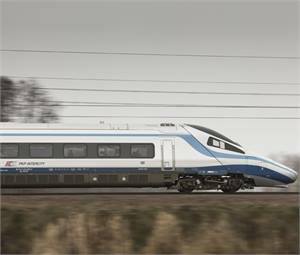 The record was reached as Alstom was conducting tests in the presence and in partnership with its customer, Polish operator PKP Intercity, to obtain circulation permission for the 20 Pendolino trains ordered by PKP Intercity in 2011. All the tests have been successful so far, which will enable PKP Intercity to start operation by the end of 2014. The contract signed with PKP Intercity also includes 17 years of maintenance and the construction of a new maintenance depot, to be inaugurated in the first quarter of 2014. The trains will circulate between Warsaw, Gdansk, Gdynia, Krakow, Katowice and Wroclaw. The previous Polish high-speed record of approximately 155 mph was set in 1994, also by a Pendolino train. Pendolino is mainly produced at Alstom's Savigliano factory in Italy. The Savigliano factory is currently executing contracts for PKP (Poland) and SBB (Switzerland).